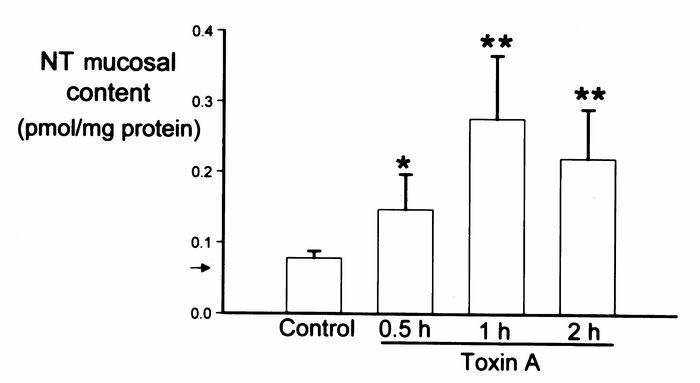 Toxin A administration increases NT content in rat colonic mucosa. One closed loop was prepared in the proximal colon of anesthetized rats and injected with either 5 μg of toxin A or buffer (Control). At the indicated time points, animals were sacrificed, colonic loops were excised, and the mucosa was removed and processed for measurements of NT content. Arrow shows limit of detection. Each bar represents the mean ± SEM of 6–8 loops for each experimental condition. *P < 0.05, ** P < 0.01 vs. control. NT, neurotensin.